November 6, 2018 Robert W.
Cheap foam board signs 20 x 30 are available in Las Vegas for your business meeting or event. These foam board signs are great for presentations where short term signage is needed because they are professional looking and also are cheap in price. 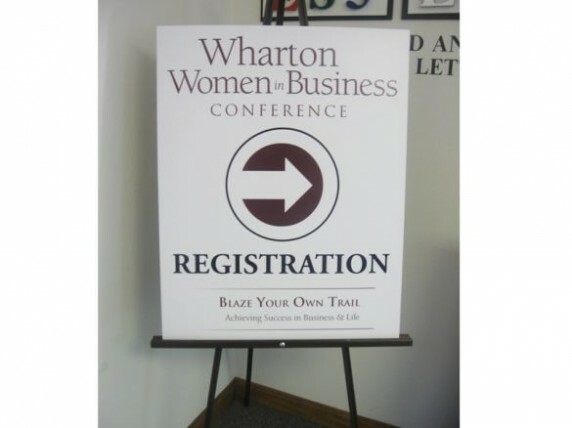 The 20″ x 30″ foam board sign is a very popular size for presentations and usually sets upon an easel for display. Cheap foam board signs 20 x 30 are printed either directly onto a foam board ( 3/16ths or 1/2″) and then laminated with a gloss or matte laminate for a professional looking appearance. Alternatively, foam board sign is printed onto a vinyl application, laminated and then applied to a foam board. The lamination is optional but most customers prefer it as it tends to protect the print. Cheap foam board signs 20 x 30 are also used at the many shows and events held in Las Vegas annually. Hundreds of shows take place yearly in Las Vegas attracting millions of people to Las Vegas. Vendors like these foam board signs because they are cheap, look professional and can simply be discarded at the end of an event. They are difficult to travel with because they are damage prone ( they are made out of foam board) and most vendors prefer to buy them in Vegas to avoid damage to the signs. Cheap foam board signs 20 x 30 and other sizes are also used at retail establishments in Las Vegas as point of purchase marketing. because these foam boards are inexpensive and look nice, retailers will place them near the cashier’s counter at a convenience store to try to get impulse buying of products while you wait to pay. These foam board signs are very successful and you will see them on the walls and hanging from the ceilings because of being so lightweight. see how these foam board signs can help you.